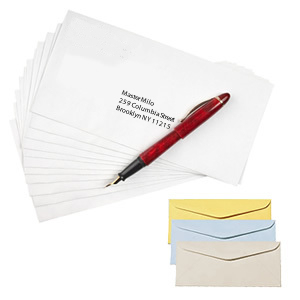 Imprinted prices include a corner card imprint in the upper left hand corner or a reply imprint in the center. All are 24 lb. wove. Call for prices on large quantities, custom sizes and colors. Reorders of imprinted items that were not originally ordered on-line or orders needing logos typeset must be called in at 800-529-6278. For more information on our composition policy click here.